Casa Genesis is a one of Granada’s oldest homes located just two blocks from the city center. This home is large and spacious with plenty of room to enjoy a quiet moment or entertain your family and friends. The home, once a very popular school, has been remodeled into a spacious four bedroom home with a large pool, two large garden areas and a wonderful patio space, great for entertaining. 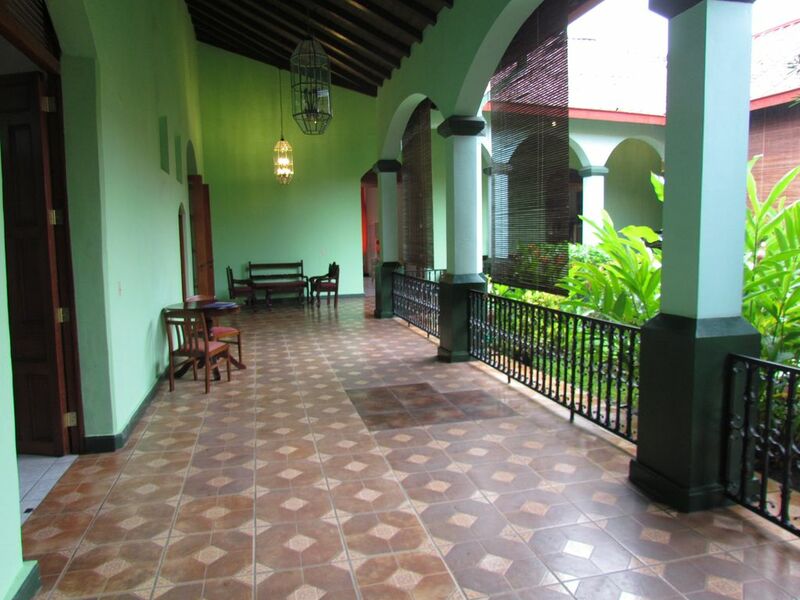 Casa Genesis is a typical Colonial home with wide corridors surrounding an open garden. The garden is green and lush with tropical plants and a bubbling fountain. The corridors offer additional seating around the garden with traditional rocking chairs, wood benches and a television area with comfy recliners. The separate living area is spacious with two separate seating areas and plenty of natural light and lake breezes. On the south corridor you will find two spacious bedrooms with two large windows giving the rooms a light and airy feel. Each bedroom has a queen bed, ceiling fan, air conditioning and share a large bathroom with a walk-in shower. The third bedroom, located on the east corridor, is quite large and has two twin size beds and one queen size bed. The bedroom has a private bath, ceiling fan, a walk-in closet and a small sitting area. The large east facing window allows cool breezes from the lake, keeping you cool and comfortable. On the north end of the corridor, you will find a formal dining room complete with a table for 10. The room is elegant and is a great place to enjoy a dinner with your family or friends. If you prefer something a bit more casual, there is a small table for four just off the kitchen area. The kitchen, at the center of the home, is fully equipped and has everything you need to enjoy simple or gourmet meals. Like most old Colonial homes, Casa Genesis has two patios, the second being the pool area. Again, the wide corridors offer you a number of opportunities to entertain around the pool. Who doesn’t love a good barbeque? With this large built-in brick grill, you will definitely be able to grill up everything from steaks to veggies. There is also a built-in bar as well as cushioned lounge chairs to take in some sun. Along the back wall of the pool area, you will find a fourth bedroom. This bedroom has a full size bed, ceiling fan and large closet. Just next to the bedroom is a full bath with shower to be shared with guests. Casa Genesis is located just a few blocks away from the central square as well as to Calle La Calzada, the most visited tourist area in Granada. This is the perfect house for a fun vacation with your friends and family.